SANDY CREEK – Sandy Creek Elementary School presented second quarter awards to students at the school based on the Leader in Me seven habits: be proactive, begin with the end in mind, put first things first, think win-win, seek first to understand then to be understood, synergize and sharpen the saw. Recipients of the ‘Leadership Award,’ are recognized for their outstanding leadership abilities and for representing the seven habits. The award was presented to: Madison Darling, Sophie Harris and Olivia Euler. Pictured with the students is Tim Filiatrault, principal. The awards were presented by Principal Tim Filiatrault to students in two separate ceremonies with parents and family members of the recipients invited to attend. Receiving the ‘Be Proactive’ award were: Michael Woolson, Autumn Phillips, Rowlan Stanton, Ryann Wilson, Phoebe Preston, Tyler Mascellino, Eben Haynes, Conner Demott, Patience Oregon, Zoey Bermond, Seth LaCelle, Anabelle Grant, Christian Kennedy, Simon Preston, Hailee Martin, Blake Stock, Emily McClosky, James Hays and Ian Ward. The following students were recognized for exhibiting the habit ‘Begin With the End in Mind’: Moxon Soluri, Ethan Hawn, Dakota Balcom, Abagail Balcom, Jayden (Wyatt) Guile, Maleki Tennant, Brayden Ashby, Kiah Bradley and Charlie Marshall. Students who ‘Put First Things First’ included: Tegan Kinney, Elizabeth Kubacki, Josephine Johnson, Peyton Clark, Nina Hackett, Hailey Skellington, Clover Dane Bush, Treylen Hunt, Lynn Dumas, Jacob Brown, Emerson Jones, Caleb Peck, Zoey Wallace, Remington Blodgett, Ana Poter, Jase Soluri, Emma Gibbons and Trevor Bort. Exhibiting the ‘Think Win-Win’ habit were: Matthew Davis, Emalee Huckabone, Leiah Bristol, Olivia LaCelle, Ciara Allen, Tyler Trumble, McKenzie McGrath, Maggie Wallace, Harper Fahnestock, Maggie Calabria, Rowan Wilson, Jacob Bort, Sara Leppien and Lawrence Herse. The fifth habit of ‘Seek First to Understand Then to be Understood’ awards were presented to: Allison Jones, JazMarie McGrath, Harley Petrie, Lola Tessier, Trenton Sedler, Colton Killam, Zoey Brown and Stephanie Dobbs. The ‘Synergize’ award recognized students who work well together as a team: Markus Chase, Caityn Guevara, Noelani Foster, Rowan McCarthy, Marissa Soluri, Madilyn Norton, Nicholas Anderson, Nicholas Baker, Noah Gioia, John Darou, Nevaah Brown and Finn Conners. Recognized for the habit ‘Sharpen the Saw’ were the following students: Chace Lasell, Kaityn Perkins, Brady Thomas, Grant Harris, Emily Walke, Cole Zehr and Caylon Zehr. 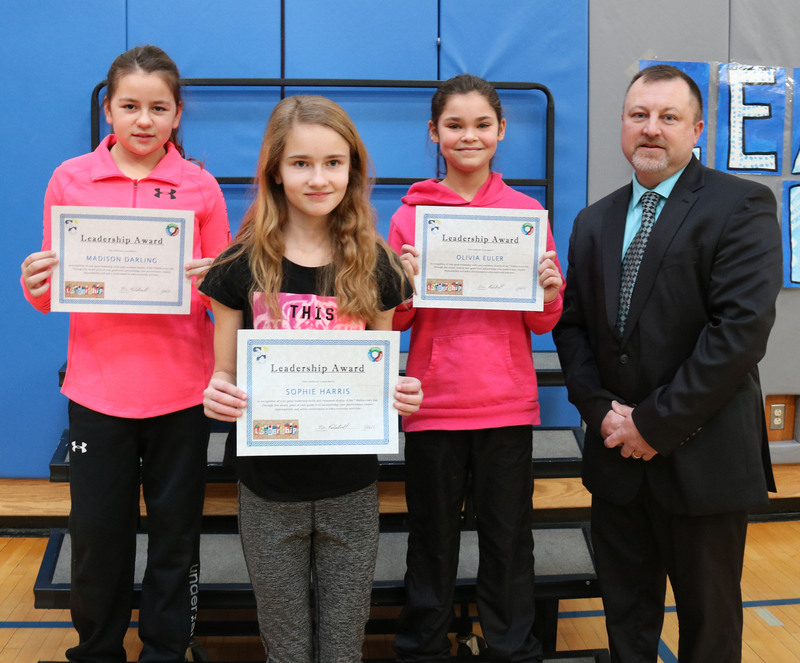 In addition to the seven habits awards, a special leadership award was presented to fifth grade students for their outstanding leadership skills. The students are nominated by their peers and selected from the nominations by a committee. The award is presented to two fifth grade students each quarter, but there was a tie resulting in three awards being presented this quarter. The leadership award was presented to Madison Darling, Olivia Euler and Sophie Harris.